When A.A. Milne wrote some children’s books inspired by his son’s stuffed animal menagerie back in the 1920s, he surely had no idea that his creation would turn into a multi-million dollar industry at the hands of the Walt Disney Company. It’s hard to look at The Many Adventures of Winnie the Pooh and not be reminded of the pervasive merchandising of the gentle brown bear. But if you need to distract the kids for awhile, you could do much worse than this movie. Released in 1977, The Many Adventures of Winnie the Pooh actually consists of three short films made between 1966 and 1974. The movie is refreshingly devoid of pop culture references, winks at grownups in the audience and frenetic editing that have become prevalent in children’s animated films. Its leisurely pace and its episodic nature should appeal to the short-attention-span set. 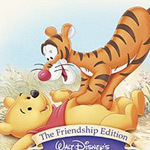 Pooh lives in the Hundred Acre Wood with Piglet, Tigger, Eeyore, Rabbit, Owl, Kanga and Roo. Their human friend, Christopher Robin visits often. Their lives are full of little adventures and misadventures. Pooh’s insatiable appetite for honey causes a great deal of excitement. The bad weather rearranges their homes. Tigger’s ebullience (and incessant bouncing) gets on the nerves of the fussy Rabbit. Everything gets put right before too long and ends with a party or a parade led by Christopher Robin. There are gentle lessons about friendship, tolerance, and the dangers of eating too much honey. The story has just enough tension between the characters and their surroundings to drive the plot, and never any villains. But mostly, the Pooh’s world is a pleasant getaway into the imagination of a child. The latest DVD release, called The Friendship Edition, has most of the same extra features of the 25th Anniversary Edition DVD released in 2002. Like the 2002 DVD release, the new edition boasts that it has been remastered and restored. A 25-minute making-of featurette tells the story behind the movie in a straightforward fashion, but doesn’t have enough inside stories to be truly interesting. “A Day for Eeyore,” a 25-minute short made in 1983, has a similar look and tone as the feature. The interactive features include a digital storybook, “Pooh’s Shadow,” which is not nearly as engaging as the movie or a real book. I tried to look at the “100 Acre Wood Challenge” game, but every time I tried to enter, I got sent back to the main menu. As with other Disney DVD releases, this disc includes galleries of images related to the development of the movie. One feature that isn’t on the 2002 DVD is an episode of the Disney Channel show, “My Friends Tigger and Pooh.” After watching the hand-drawn animated movie with the occasional pencil line, it’s a little painful to watch this clunky, 3D, computer-animated creation. The restored and remastered picture and sound are very good. The picture is presented in its original 1.33:1 aspect ratio. For the kids, pop in the DVD and play the movie. If they want more, switch to the Eeyore short. Grown-up fans can look at the featurette and the galleries as well. The rest is skippable.